Ellie is an orthodox Jewish teenage girl living in Toronto in the 1980s. When she falls in love with another girl, it's a huge crisis: She can't see how she can be a lesbian AND still be a member of her Jewish community. Her mother is convinced Ellie has a "messianic" role to play - but Ellie feels forced to figure out which part of her identity to keep: The Queer part, or the Jewish part. Cool info about this book: Leanne submitted this manuscript to Orca Book Publishers' "So You Think You Can Write?" 2008 contest - and she won! The prize was getting "Gravity" published! 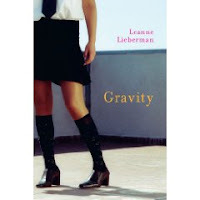 It was also announced today (1/7/09) that "Gravity" is a Sydney Taylor Book Award Notable Book for Teens. Thanks for posting about GRAVITY. I'm thrilled that it was honored by the Sydney Taylor Committee, of which I am a member. It is a thoughtful coming of age novel that touches the heart. I highly recommend it to teens - and adults, too.